Josh has always had a strong passion for helping others in any way possible. When choosing a career Josh felt that his passion combined with e3's powerful Process and Philosophy were a perfect union. Josh believes that it has never been more important to start saving early in life than it is now due to the trending state of the federal budget and the possibility of rising taxes. It is his belief that the status quo will not suffice for his generation and it is incumbent upon him to provide council to as many people as possible on self-reliance for their financial future. His mission is to not simply put money away, but also to advance and protect it. 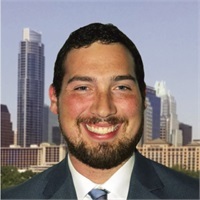 Josh graduated from Texas Tech University in 2013 and is currently working toward becoming a full time financial advisor with e3 Wealth. He currently hold a Life and Health Insurance License and is now working toward securing his Series 7 & 66 licenses. He has also been a recent guest on the Advance & Protect Radio show, which airs Sunday afternoon from 2:00pm - 3:00pm on Talk Radio 1370AMKICE. Josh was born and raised in Austin, TX to Mark Huard, Austin Police Sergeant and Carol Huard, English Teacher at Leander ISD. When not working he spends his time outdoors with his dog Nakona, or playing league sports with his friends.